For as long as I can I remember prayer has been a part of my life. Kneeling by my bed as early as 7 or 8 years old I don’t recall what I prayed for, but I do remember having the assurance that God heard me. This is one area where I have not wavered in my faith. I consider it a tremendous gift from God and it humbles me greatly because I know it isn’t anything I did on my own, but only possible through the power of His grace and mercy. There are other areas, however, I continue to struggle with greatly such as fear. Right alongside the faith that He hears, is the fear that has nipped at my heels constantly throughout my life. We all have different gifts and different weaknesses. Some struggle with severe doubt that God hears their prayers and some like me struggle with the fear of failure, of not measuring up. Whatever our particular weakness is, we know that the root cause is lack of faith. How do we get that faith? One way that helps me by hearing the word of God. 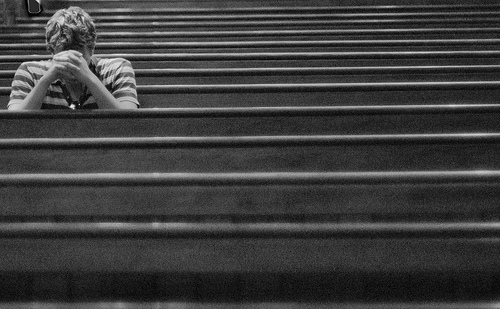 Here is a question, is hope that He hears our prayers enough even when our faith is weak? This entry was posted in Christian living, Multitude Mondays, Prayer, Walking with God. Bookmark the permalink. My biggest problem is focus. In group prayer my mind is forever trying to allow noise into the quiet. I seem to pray deeply when I am alone in my room or when I am talking to Him as I drive to work in the morning. Gone are the distractions.